Where has equine chiropractic begun? Where it is going? Animal chiropractic, veterinary chiropractic, and chiropractic techniques applied to domestic animals really began with horses being adjusted. Why? Because for the last 6000 years we spent unlimited amount of time and energy developing selective breeding of the horse to serve man and to optimize their service to us. Invariably our beloved horses and workmates break down and injure themselves and we can sense that their motion is compromised. We can then endeavor (if were adequately trained) to rehabilitate the motion of those joints and therefore rehabilitate the function of our horses. Chiropractic as an inexact science. This is been done for thousands of years as an inexact science. It wasn’t until approximately 1915 of the last century that BJ Palmer (the son of the first American chiropractor of the same name) endeavored to develop his method of adjusting horses derive from techniques from human chiropractic therapy. Then for the last hundred years chiropractors have been evaluating and treating horses whose joints were compromised by what is known as the vertebral subluxation complex. Horsemen and women would evaluate their horses motion or lack of joint mobility and “force” the joint back into its normal range of motion. This was known as manual chiropractic adjustment. Often it is referred to by this author as “horse wrestling”. First horses, then smaller pets. Why equine before it was small animals? Why would this technique be developed in the equine before it was developed in small animals? In 1982 Dr. William Inman DVM CVCP, a veterinary surgeon and veterinary neurologist became tired of putting animals to sleep that medicine and surgery would not fix and developed a technique of animal adjusting using a hand-held spinal accelerometer (a scientifically developed chiropractic mallet) that was previously used in human beings, and applied that device to dogs and cats. At about the same time throughout the United States chiropractors such as Dr. Sharon Willoughby DVM, DC was developing a manual adjusting technique for horses and cattle in Port Byron Illinois. Dr. Inman and Dr. Willoughby were not aware of each other however were working parallel courses in a similar field, one was small animal, and the other in horses particularly. In the late 1980s Dr. Inman, seeing the incredible success of instrument aided adjusting and diagnosis applied the technology to the domestic horse and the VOM technology (Veterinary Orthopedic Manipulation) dedicated to horse adjusting began. It has since dominated the field for horse adjusting horses due to it’s completeness, applicability, and success. Not to mention of course it is incredibly safe and has a diagnostic capability associated with it. To date over 8300 graduate doctors of veterinary medicine and chiropractic care have learned this technique and apply it to animals every day. It is the most commonly used technique of animal adjusting in the world. Surely better than “horse wrestling”! VOM technology became a “better mousetrap”, as compared with relatively and imprecise and sometimes harmful manual adjusting or “horse wrestling”. But the question is why would this type of technology be applied to horses in the first place? Why not standard therapies in medicine and surgery that we’ve used for hundreds of years? Certainly with our advances in medicines and surgical techniques, healing methods that as old as chiropractic would not be indicated or efficacious. The answer to this question has to do with the size of the patient. A 600 to 1600 pound horse most certainly can be operated on however the operations very commonly will take hours and a huge creature like a horse cannot lay on its side for that period of time without collapsing their lungs. The surgeries are always a success. however the postoperative infection and or pneumonitis and/or pneumonia that can ensue from being down on its side for three or four hours eventually culminates in a horrible infection or injury to the organs of the horse and the animal dies of delayed effects of the surgery event itself not the actual surgical procedure. Likewise, using medications that are dependent upon concentration in the bloodstream becomes relative to the animal size and weight. Many of the medications that we use in dogs and cats, and even in people, once dosed for a 1200 pound horse would make the medication costs so incredibly expensive that that therapy would not be practical even if we can get it into the horse. Physical therapy and other manual adaptive techniques are particularly difficult in the horse as we cannot necessarily induce the horse to cooperate. There exists then a whole class of disease processes that occur in the domestic equine involving organ function, lameness, gaiting, structural integrity, and injury, that are not routinely treated with classic allopathic medical techniques, therapies and medicines. Well-trained human chiropractors for the last 120 years have formally been recognizing musculoskeletal problems in the horse, analogous to the ones they treat in humans and optioned to try human chiropractic “moves” to try to ameliorate the similar disease process in the equine. Very often with very good results. And at that point equine chiropractic as we know it now began and continues to thrive. It gets down to this fact that there are a lot of things that classic veterinary care cannot treat effectively and/or quickly and/or cheaply where veterinary equine chiropractic techniques can. Pet owners need to be aware of the solution. Very few pet owners who have dogs and cats are aware of the fact that there are dog and a cat chiropractic techniques out there that are incredibly effective, safe, and are applied throughout the United States. However, almost every horse owner is aware the fact that somebody in their area applies chiropractic techniques to the equine for the benefit of problems associated with lameness, gait, function, etc., etc. It boils down to the fact that there are actually two different major types of equine chiropractic. 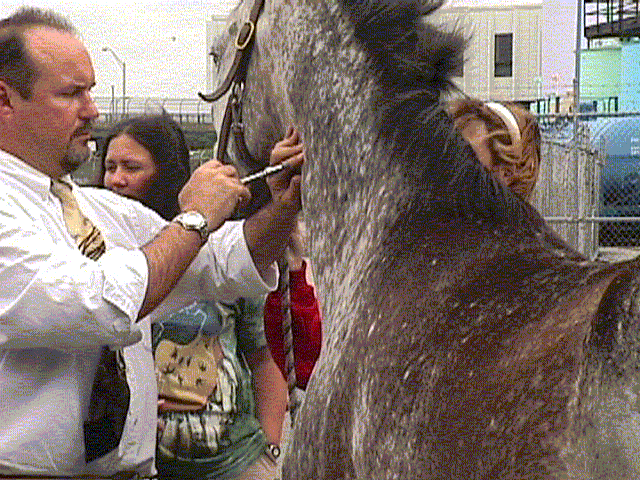 manual adjusting technique, which is the motioning of joints using the practitioner’s hands, and instrument-aided equine chiropractic which uses a hand-held spinal accelerometer to deliver an ultrafast, safe, effective reduction of the neuronal interference (vertebral subluxation complex). How do I find an Equine Chiropractor near me? International Association of Veterinary Chiropractitioners (IAVCP) certificates veterinarians on instrument-aided equine adjustment (better known as; Veterinary Orthopedic Manipulation – VOM). This organization has trained over 8300 graduate doctors in the United States alone. IAVCP is the largest animal adjusting group in the world. It is used more than all other horse adjusting methods combined. Practitioner trained by that organisation may be found in VOM-Trained Equine Practitioner Near Me webpage.